James Lloyd at Edmiston & Company tells me that the 24.38m sailing yacht Ma Geisha has reverted to her previous name of Malizia and has also had her price reduced. She was built by Perini Navi in 1989 as the last in the yard's line of 25m superyachts and Malizia has recently returned to the water after an extensive period of refit work and upgrades, including having her engine room totally stripped out and rebuilt. She accommodates six guests in a master suite, plus a double and single cabin and has a generous full beam main saloon. 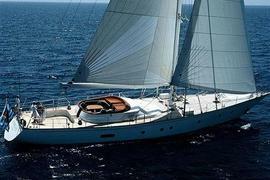 Currently lying in Antibes, the asking price of Malizia is down from €2.3 million to €1.95 million.